Model sees 20% U.S. stock slump, credit spreads 115bps wider. Loss of liquidity in financial markets could worsen results. How bad will the next crisis be? JPMorgan Chase & Co. has an idea. A decade after the collapse of Lehman Brothers sparked a plunge in markets and a raft of emergency measures, strategists at the bank have created a model aimed at gauging the timing and severity of the next financial crisis. And they reckon investors should pencil it in for 2020. The good news is, the next one will probably generate a somewhat less painful hit than past episodes, according to their analysis. The bad news? Diminished financial market liquidity since the 2008 implosion is a “wildcard” that’s tough to game out. A U.S. stock slide of about 20 percent. A jump in U.S. corporate-bond yield premiums of about 1.15 percentage points. A 35 percent tumble in energy prices and 29 percent slump in base metals. A 2.79 percentage point widening in spreads on emerging-nation government debt. A 48 percent slide in emerging-market stocks, and a 14.4 percent drop in emerging currencies. “The shift from active to passive asset management, and specifically the decline of active value investors, reduces the ability of the market to prevent and recover from large drawdowns,” Joyce Chang and Jan Loeys wrote in the Monday note. Actively managed accounts make up only about one-third of equity assets under management, with active single-name trading responsible for just 10 percent or so of trading volume, JPMorgan estimates. This change has “eliminated a large pool of assets that would be standing ready to buy cheap public securities and backstop a market disruption,” Chang and Loeys warned. One silver lining is in the recent rout in emerging markets: it means assets in developing countries have cheapened this year, helping limit the peak-to-trough declines during the next crisis and offsetting a buildup of leverage, Normand and Manicardi wrote. Besides the liquidity question, Normand and Manicardi highlighted the length of the next downturn as a critical unknown in gauging how bad things will get. The longer a recession lasts, typically the bigger the hit to markets, their analysis of past episodes shows. 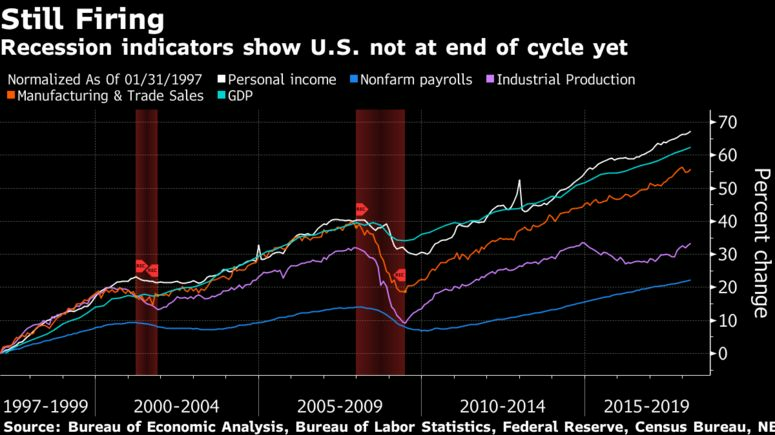 “The recession’s duration is a powerful drag on returns, which should dovetail with some readers’ concerns that policy makers lack the necessary monetary and fiscal space to extract economies from the next recession,” they wrote.